Find out more about Hot Foot InvisiNet or contact us to learn how Hot Foot can help you get rid of pest birds for good. Researchers have to be constantly vigilant for outside contaminants affecting their outcomes or destroying their samples. In this case, those "contaminants" were hungry cormorants, large birds that were swooping down and taking fish used in a research study from several large ponds. The problem was so bad that the project was being affected as the cormorants carried away too many of the research subjects. The researchers called in Hot Foot to see if they could stop the cormorants from stealing free meals. 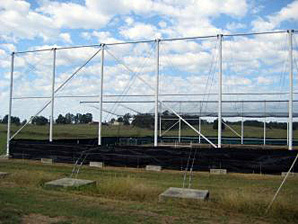 The bird deterrent experts at Hot Foot designed a system using its InvisiNet exclusion netting that enclosed the fish ponds completely so the cormorants couldn�t get in. For the human researchers though, it was not a problem - gaining access to the fish ponds was as easy as holding back a curtain. 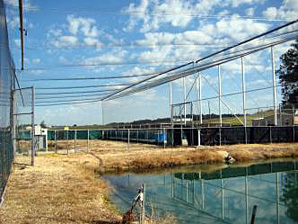 The netting is so durable that Hot Foot even used it to divide the ponds and separate the fish as necessary. Since the InvisiNet system can withstand the harsh climate conditions including heat in the summer, freezing rain and snow in the winter, and high winds, it will be effective for years to come. The result: thanks to Hot Foot, the number of fish lost to cormorants was reduced to zero, and the research carried on successfully. Plus, the researchers found a new and efficient way to separate their fish population!